And since I believe in giving my buddies the same treatment ordinarily reserved for Legacy greats such as Julian Knab, I resolved to do a real interview with him. So here’s the summary of our lengthy talk on the six-hour drive home from Prague, during which we got lost in the woods, nearly ran out of gas and ended up in a midnight traffic jam. 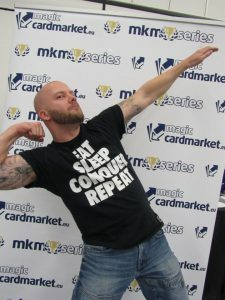 Morten Storm posing triumphant in Prague. Image: Magiccardmarket. First things first – what the hell is going on in that picture? You’ve been quite successful in small and regional tournaments, but now you’ve made the Top 8 of the very first 200-person-plus tournament you’ve ever attended – how did that feel? To be quite honest, I did not really think about anything at the time. There was neither an OMG moment nor a feeling of “Yeah, I did it!” I did not realize how improbable it all was until one or two days later. But even then, although I’m really proud of my achievement, I’m not quite harboring any delusions of godhood yet. Luck always plays a big part. The entire tournament, I had very good keeps, good draws, and just a few mulligans. When did you first realize that you might end up in the Top 8? Ironically, my fifth round opponent brought it up. He was quite angry and kept saying that losing to me meant he was out of Top 8 contention. That was when I realized that I was actually in Top 8 contention. But it only became a real possibility two rounds later, when I understood that winning meant I could draw into the Top 8. But even then, I knew my opponent, Stefan Schütz, was an excellent player. Even worse, he was playing Miracles, which I had not extensively tested my new decklist against. Sudden Shock took many opponents by surprise. 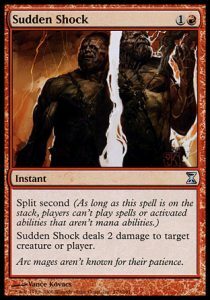 This card was actually a last-minute addition: We discussed the merits of Sudden Shock in the current meta during our drive to Prague. Morten actually went through with the idea, traded for one – for an oatmeal bar, no less – and put it into his decklist as the judge was already impatiently waiting for him to hand it in. Speaking of Miracles, all Top 8 players, including you, voted it as the best deck they didn’t play. Why do you think that is? For the time being, Miracles is still the king of the Legacy metagame. Miracles has been the most dominant deck in the meta for a few years. Here and there, other decks briefly succeeded in taking the top spot, but Miracles is always among the top three. That really speaks to its adaptability. The deck has survived every meta shift over the last years without really losing ground. 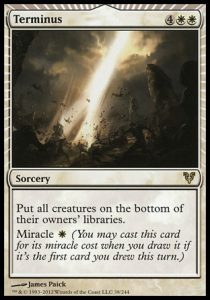 In my opinion, the main reason for that is its high reliability – Miracles is incredibly good at finding the right card for any specific situation and can present a suitable answer to almost any threat in the metagame. It’s as good as it ever was. You, on the other hand, chose to play Grixis Delver. Why is that? I’ve focused on Delver lists for some time now. The archetype is not only fun to play, it also follows a very tight gameplan while still being able to respond to a variety of plays. Delver decks are also highly reliable and have almost no extremely unfavorable matchups. Even the worst ones are still winnable with skill and a little luck. Before the tournament, I was undecided whether to play Canadian (RUG) or Grixis (BRU). I finally decided on Grixis, even though I’ve played Canadian longer – Grixis has a higher curve and is less vulnerable to cards such as Chalice of the Void or Counterbalance, which makes it more of a multi-angled threat overall. On top of that, I was looking for something a little more proactive than Canadian. In hindsight, do you feel that was the right choice? 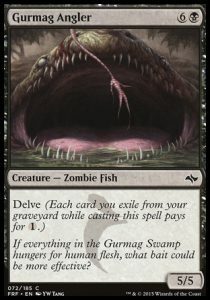 Gurmag Angler is one of the many diverse threats Grixis Delver offers. Definitely. All in all, my matchups might have been slightly unfavorable, but none of them were unwinnable.4 In several key situations, RUG would have fared worse. More than my own deck choice, I think that my accumulated Legacy experience is finally starting to really pay off for me: Nearly every deck I faced, I either play myself or I play against it regularly in our playtest group. For every matchup, I had a good idea about which role to play, which lines to pursue, and which cards would be the MVPs worth protecting. Having your tactics laid out like that frees your mind to think about the larger strategy. Do you now feel motivated to play more Legacy than before? I think I’m on a good path as a player. I would certainly like to play more, but the logistics of it are complicated. The way to become a better player would definitely include playing online whenever possible, but I’ve never liked that. For me, a large part of what I like about Magic is the interaction with another person. You meet a lot of great people at tournaments. Reaching the Top 8 at such a large tournament as MKM Prag is definitely a bucket list item for me; now that I’ve done it, maybe I might even be able to repeat it. But even if I don’t, no one will take this success from me. While Morten was busy winning everything, I spent my time interviewing interesting people. Among others, I talked to Legacy champion Julian Knab (who by accident ended up being my opponent later on) and tournament organizer Marko Schädlich. Check out these interviews if you haven’t already. 1. He would also like me to mention that he is an avid brachiosaurus rider, part-time viking, and is currently barred from international bass fishing competition for violating the centuries-old bass fishing code of honor. 2. Brock Lesnar is a good spirit animal as long as you’re winning. 3. The clear stand-out performer in the sideboard was Sulfuric Vortex, which is a valuable post-board threat against slower decks. The Vortex was the deciding factor against Miracles and against Colorless Eldrazi – twice! 4. In this order, Morten faced LED Dredge (win), Grixis Delver (win), Grixis Delver (loss), Infect (win), Colorless Eldrazi (win), Colorless Eldrazi (win), Colorless Eldrazi (win), Miracles (win), Lands (Draw).